Bheem and his friends Raju, Chutki and Jaggu all have a great time in Dholakpur. In this volume, our hero fights a dangerous crocodile who is creating chaos in Dholakpur. Watch Bheem teach Kalia a lesson by playing his own trick against him. Also, Bheem joins Raju to find his father who is lost in the desert. 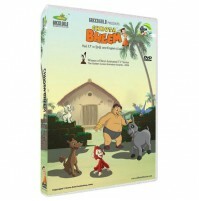 Catch Bheem and his gang fighting it out!.